JAMMU, Feb 16: Minister for Medical Education, Youth Services and Sports, Taj Mohi-ud-Din today felicitated noted Gujjar intellectual and former Vice- Chancellor, Masud Choudhary who, was recently awarded the Degree of D. Lit (Honoris Causa) by the Baba Ghulam Shah Badshah University (BGSBU), Rajouri. The function was organized by Gurjar Desh Charitable Trust, Jammu. Addressing the function, the Minister highlighted the contribution made by Masud Choudhary in public life describing him as visionary and a dreamer. He said as the founder Vice Chancellor of BGSBU his role has been monumental in raising a world class academic institution in the state from scratch. He said today’s status of the university owes its credit to the tireless efforts of Mr. Choudhary. Mr. Taj said apart from being a police officer of impeccable record and later the VC, BGSBU, Mr. Choudhary has tremendous contribution to society. He said his contribution to raise the level of Gujjar community can never be forgotten. 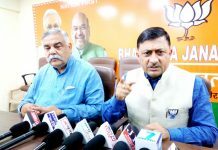 In his presidential remarks, Vice Chancellor, Central University of Jammu and former Chief Secretary, Dr. Sudhir S. Bloeria described Mr. Choudhary as a man with qualities of head and heart. He said his experience of working with him over the past three decades has been very great. It may be recalled that Mr. Choudhary was awarded the Degree of D. Lit (Honoris Causa) by the Baba Ghulam Shah Badshah University (BGSBU), Rajouri at its convocation held recently. Prior to his appointment as VC, Mr. Choudhary retired as the Additional Director General of Police.